Good teamwork ensures the close collaboration and coordination between professional groups and across disciplinary boundaries. This is particularly important in healthcare centres and clinics admitting complicated patient cases, but contrary to what many healthcare organisations seem to believe, effective teamwork does not happen automatically. It needs to be successfully trained and practiced. Teamwork in Medical Rehabilitation provides a guide to efficient teamwork in professional healthcare. 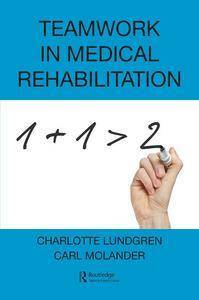 Showcasing the practice of medical rehabilitation in Sweden, the book describes how to create, develop, nourish and organise a team. Medical rehabilitation in Sweden is a discipline filled by not only doctors and nurses, but also physiotherapists, occupational therapists, psychologists, social workers, speech therapists and dieticians. Using these multi-professional teams as clinical case studies, the book contains many practical examples from different rehabilitation care areas. This book will prove to be invaluable to healthcare professionals and students as effective collaboration is essential to good clinical outcomes. Managers will also find this a worthy read thanks to its understanding of how working conditions affect good teamwork.